Cinema Treasures concludes its look at the work of artist/photographer Larry Grossman with an interview with the artist. What are your favorite movie theaters? All in CA (since that’s where I live and go to the movies): Chinese, El Capitan, Cinerama Dome, Los Angeles, Avalon (Catalina), Fremont, Pantages (but they no longer show films), to name few. The Maltese Falcon, Bringing up Baby, Chinatown, McCabe & Mrs. Miller, Splendor in the Grass, Godfather I & II., L.A. Confidential, American Graffiti, etc, etc. How long does it take to complete a single piece? It varies of course, usually within a week, but I often tweak and revise them for days. In some cases I’ve revised them months after they were “done”. Do you take reference shots of each theater that appears in your work? reference and accuracy. Cinema Treasures was very helpful for research. How do you choose the movies listed on the marquees in each theater image you create? I usually just use my favorite films (or titles I like the sound of) for the marquees. Also, the poster for the film plays a part, as I incorporate that in the picture in the display cases. I take pains to make sure that the cars are never newer than the movies “playing”, and that the license plates on the cars are of the year of the films playing. Of course both the cars and second bill films can be older, as not all second bill films were first run (and not all cars are new). I began my “Movie Palace” series in November of 2003, and the first exhibition is now taking place (through Sept.) at the world famous Cinerama Dome/Arc light Cinemas in Hollywood. If you go to the “News” page on my web site: www.retrovisions.com, you’ll see examples of the signed, limited edition Giclees (Iris prints on canvas) on display. I’m thrilled to have this show at the Cinerama Dome, not the least because it’s one of the theaters I had used for my series. In fact, Pacific Theaters (who own the Dome) commissioned me to publish a poster of my image. That poster, along with six others are for sale in the Dome/Arclight gift shop. Are there any theaters you’d really like to do? How long have you been creating these images? How did you start? I had been working since 1997 on another series entitled “Virtual Visions”, which are surreal digital collages (you can see them on my web site). I have had a number of shows with this work, which was based on my large collection of my own photos. I had also taken many pictures over the years of vintage everything, including movie houses. In November of 2003. it one day occurred to me that it might be a fun challenge to use my collaging skills to “transport” some of the theaters I had photographed back in time to their heyday. The real challenge was to get the details of the theaters, and the cars, clothes, signs etc. as accurate as possible. Theaters such as the Panatges (in Hollywood) required a complete “restoration” of the marquee, which had been completely modernized. I had only old black and white photos as reference, so I had to guess at the color scheme as I digitally recreated the original neon. How can Cinema Treasure users buy prints of your work? If readers would like to purchase either posters or signed, limited editon Giclees of my work, they should visit my web site: www.retrovisions.com and go to the Order page. All of the images are available as Giclees, seven are available as posters. With artists like Davis Cone and yourself, do you feel there is a boom in movie theater related artwork? My plans are to keep producing more theater images, as well as others subjects. In fact, I’ve just finished “recreating” the famous (and long gone) “Brown Derby” restaurant on Wilshire Blvd. in L.A., as well as a series of vintage car/gas station pictures, all of which will soon be published as posted. 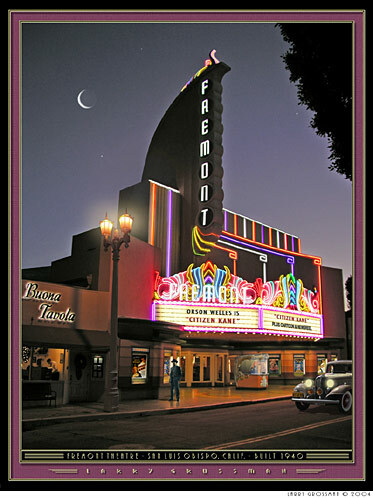 Larry Grossman’s “Movie Palace” series of Giclee prints is currently on display in the Cinerama Dome/Arclight Cinemas Upper Gallery, June 30 – October 1, 2004. In addition, Grossman’s “Virtual Visions” series of surreal Giclee prints and Photo prints is also on display in the Lower Gallery from August 4 – October 1. The world famous Cinerama Dome / Arclight Cinemas is located at 6360 W. Sunset Blvd., in Hollywood, CA. Plus, the Arclight Cinema Gift Shop (in the lobby) is now selling Grossman’s entire collection of “Movie Palace” posters, including the “Cinerama Dome” poster (depicted below), which was commissioned by Pacific Theaters. These posters will be on sale indefinitely. They are simply fantastic, I love the attention to detail. I think I’ll buy one of each! It’s been fixed — thanks Charles. I’d love to know how Mr. Grossman gets those beautiful skies using Photoshop 8. Gorgeous images. Has he considered putting them on a calendar or in a book? You are a very talented person, Mr. Grossman and thank you for sharing your work with all of us on Cinema Treasures!